Cecil Bisshop Harmsworth, 1st Baron Harmsworth (1869-1948), was the younger brother of the press proprietors Lord Northcliffe and Lord Rothermere. Although he played a role in the early development of the Harmsworth journalistic empire, Cecil chose a political career. He served as Liberal MP for Droitwich from 1906 to 1910, and for Luton from 1911 to 1922. After holding a number of minor government positions under Asquith, Harmsworth became a member of Lloyd George's War Cabinet Secretariat in 1917, and from 1919 to 1922 served as Under-Secretary of State at the Foreign Office. 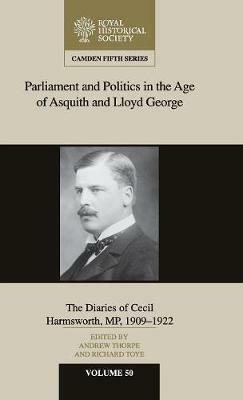 Harmsworth's diary forms a highly readable record of the politics of the period, detailing late-night Commons sittings and the rough and tumble of the campaign trail, as well as giving skilful pen-portraits of the major figures of the day. Northcliffe complained that Harmsworth lacked the ambition to make it to the front rank of politics, but his diary is a fascinating source.